Notting Dale will provide the equipment needed for filming on the day. Before equipment can be used students must book the equipment one week in advance so the tutor's can prepare the order and make a check list. Here is an example of Notting Dale's Booking Form. 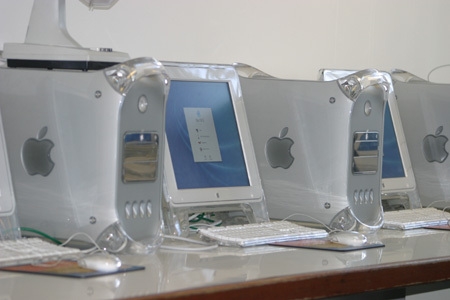 In the classroom students will use the Dual 1.42 Ghz G4 Power PC macintosh computers for doing Editing in Final Cut Pro. These computers work perfectly well with Final Cut Pro and takes advantage of it's real time rendering capabilities. In total we have 15 computers, each with it's own Dual Processor and DVD/CD-RW. Notting Dale has a wide variety of Props and Wardrobe outfits that are available for students to use upon request.